Sent to Auckland Transport 50 sec later. 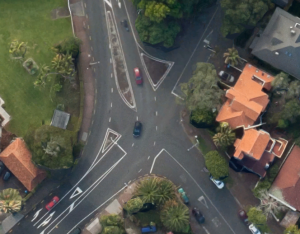 I want to strongly recommend the Auckland Council to install traffic lights in this dangerous intersection. As I write this letter, there has just been a serious car accident at this intersection. This is an intersection which does not have traffic lights. It has a high volume of traffic, especially through Gladstone Rd and St Stephens Ave. The layout of the intersection is unconventional, therefore drivers are often confused as to who has the right of way. Cars turning into Gladstone Rd from Takutai Street (or St Stephens Ave) has to look for traffic in three directions, and I have had a couple close calls myself. This intersection is right next to Parnell District School, and it poses a danger to the children attending the primary school. I look forward to hearing back from you. Thank you.